Keep of Kalessin most recent Epistemology just finished playing, for the second or third straight time, and I am sitting here all numb and speechless, asking myself just one question. What happened? I would still go to battle defending Keep of Kalessin for the bold transformation they have undertaken with Armada. Many were critical of the band seemingly abandoning the traditional frozen and grim black metal roots, shifting to more accessible melodic sound. I had Armada very high on my album list in 2006, and heard a lot of passion with obvious innovation displays. Representing the wave of the modern black metal future, Armada appealed to me no less than Through Times of War or Agnen. I still pop in Armada rather often to enjoy flamenco breaks in The Black Uncharted and scream “We will walk behind you” alongside The Wealth of Darkness. When Kolossus came out I rushed to buy it, wasn’t quite thrilled the first few times through, but promised myself I would delve into the album deeper at some later point. After one spin of Reptilian I thought the best thing about it was a T-shirt which came along in the bundled package, so that I could show it off to the unsuspecting colleagues in my company. After Reptilian Norwegians went on 5 year hiatus, fired their vocalist Thebon, and finally produced Epistemology. When bands whose past outputs I enjoyed release albums after long breaks I am generally very unassuming, just hoping the troupe would roar back and remind me why I was into them to begin with. Epistemology, sadly, is probably putting the final nail into the Keep of Kalessin coffin for me, bearing witness to the evolution of the band away from anything I like in melodic black metal. In fact, mentioning the album and the words “black metal” in the same sentence is probably unfair. To both, in fact. The genre itself, since Epistemology definitely does not belong there anymore, but also to the band, since they apparently do not want to be narrow-labeled either. In the end, though, does it matter if the genre tag is fulfilled in accordance with its canons? Of course not, as long as the music is captivating. Epistemology, sadly again, failed to do that for me, and, I boldly predict, will fail to do it for a lot of people, as passion and innovation have been entirely stamped out and extinguished from Keep of Kalessin psyche. I am struggling to provide you a comparative example of a band, album or composition, where repetitiveness and one-note approach have been elevated to the extent they are on Epistemology. To run every song on what is literally a single 2-note riff is rather pretentious to begin with, but to drag on this in-your-face endless chopfest for over 7 min at a time (The Spiritual Relief, Dark Divinity, The Grand Design, Necropolis) is almost obnoxious. Add to it absolutely faceless, bordering on drum machine, constant blasts, and the rhythm pattern is pretty much a proper complement to the monotonous chords. Where Armada was rousing in its chops, listening to Epistemology is like chewing on dull tasteless food with no access to water to wash it down. Dark Divinity and Necropolis can be harsher in tone than The Spiritual Relief or The Grand Design, but they are just as devoid of emotion and charismatic qualities. The Grand Design attempts to inject energy into its helicopter chug by playing some simplistic melodic chord progression over the top, while The Spiritual Relief relies purely on synthesizer to create the atmospherics it is seeking, and some glimpses of middle- Eastern melody in Necropolis cannot possible save it either. It is almost uncanny that the shortest Universal Core is probably my favorite track on the album, as it does not extend endlessly and has some flow to its blasting. The closing title track quickly self-deprives itself of the opening muscle, and transitions into a surely nice melodic sequence, but not when you play it 50 times in a row for almost a half of a 10 min song. Then there are vocals and atmospheric attempts in Epistemology. Not that Thebon was one of my favorite vocalists, but Obsidian Claw is now at the mic himself. His harsh vocals are hardly extreme, or better than Thebon’s, but then there is this vision that many moments on Epistemology have to be buttressed by clean layered chorals. Maybe it is the philosophical lyrical subject that calls for this vocal approach (although the title track is pure plucking words from the dictionary to see if they will stick), but it does little to hide the compositional shortcomings and on Introspection it actually totally irritates. In the end, this is the opinion I offer about Epistemology as to what was behind the album’s creation. 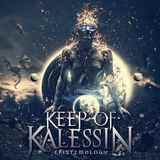 Of course I was not in the room when these songs were conceived, but probably Keep of Kalessin felt the urgency to remind the musical world of themselves. Short-staffed, but mainly lacking attractive ideas, they have stuck to a few they had, hopelessly trying to stretch them into full sympho-extreme-yet-melody-friendly numbers. The final result is not of course unlistenable. Keep of Kalessin can still play their instruments, and do it tightly. Modern production values can make them sound bigger than they are. But then I struggle in thinking who this would appeal to. Classic black metal fans gave up on the band long time ago. Circa Armada Keep of Kalessin aficionados, like me, have been losing faith slowly. So, will Epistemology be an introductory draw for some young and unsuspecting peeps to explore black metal riches based purely on the genre associations? Let’s hope they will not label the whole realm of black metal endlessly boring just on the basis of learning about it from Epistemology.